That oh-so-trendy Apple "Special Deals" store has been restocked yet again, this time with MacBook Pros. The store has a wide variety of models available with different discounts. See the list below for information about each, compiled by Dealhack. • 15-inch, 1.83GHz Intel Core Duo for $1999 - $700 = $1299. • 15-inch, 2.0GHz Intel Core Duo for $1999 - $650 = $1349. • 15-inch, 2.16GHz Intel Core 2 Duo for $1999 - $400 = $1599. • 15-inch, 2.16GHz Intel Core Duo for $1999 - $500 = $1499. • 17-inch, 2.16GHz Intel Core Duo for $2799 - $800 = $1999. • 17-inch Glossy Display, 2.16GHz Intel Core Duo for $2799 - $800 = $1999. 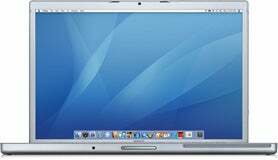 • 17-inch, 2.33GHz Intel Core 2 Duo for $2799 - $500 = $2299. The $800 off the powerhouse MBP is nice, but too bad it only has a Core Duo processor. If I had to choose one, I would probably pick the Core 2 Duo MBP for $1,599.